Charlotte is perfectly happy being the behind the scenes songwriter and manager for the band she started with three guy friends. But when two of her friends, Oliver and Trip, have a major disagreement that sends Trip packing and opens up the band to two new members, everything changes for Charlotte. Suddenly her best friends aren't talking to each other, and she's got a major crush on her new bandmate. And when her place in the band is shifted, it's suddenly a lot harder being friends with all of these guys. Terra Elan McVoy's latest novel portrays the weird push and pull of high school friendships and dramas very well. Charlotte has a lot on her plate between her family, school issues, friend drama, and the band's new found success. McVoy gives it all equal treatment, making Charlotte seem like a very reachable and likable protagonist, despite her mistakes and occasional bad judgment calls. She struggles with finding her place among the guys, coming out of her shell, learning what constitutes a good friend, and how to deal with staying connect with her sister, who is off to college. There are a lot of really great, colorful characters sprinkled throughout the book, though I would have liked to see more of Trip, who becomes estranged from Charlotte throughout the majority of the book. The timeline of the novel is nice and works well for the story, and for the most part the book is nicely paced and keeps you moving forward. Fans of McVoy's previous works and musically-centered books will really enjoy this unique and fun book with a lot of great messages about friendships and romances. Cover Comments: I love the bright blue of the cover background and the sweet coffee image. It's simple and very nice! I do like the cover. 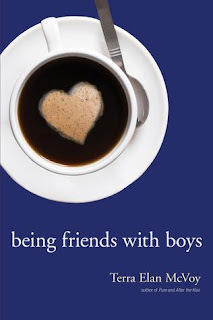 BEING FRIENDS WITH BOYS sounds like an enjoyable read.